Two and a half months after Typhoon Haiyan (local name Yolanda), considered the strongest typhoon that hit the Philippines and the world, struck the Eastern Visayas Region last year, the NCCP-ACT Alliance continues to provide relief assistance to the affected communities. The NCCP-ACT Alliance established two field offices in its areas of operation. For Samar/ Leyte, the UCCP (United Church of Christ in the Philippines) Church in Tacloban City agreed to be the field office. For the Panay/Capiz/Antique area, the IFI (Iglesia Filipina Independiente) Church in Batad, Iloilo serves as the center of operation. 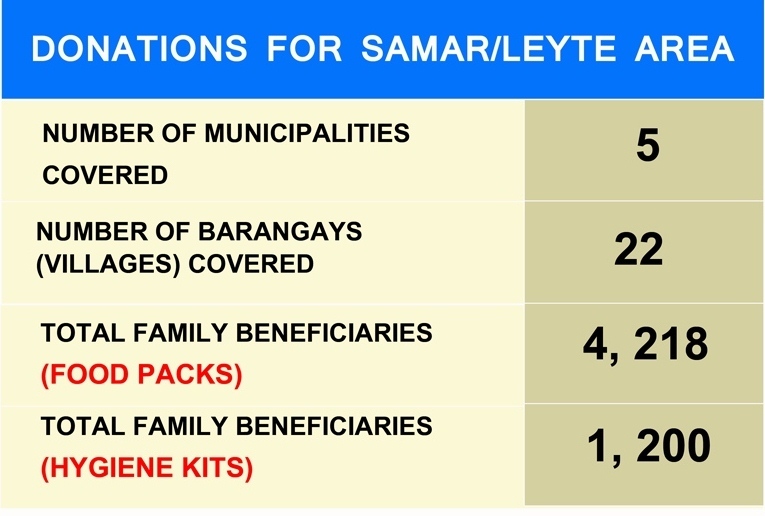 This is to facilitate relief distribution and the rehabilitation projects in the two areas. A national project staff oversees the implementation of the whole project. Areas still recovering from the effects of Typhoon Yolanda (Haiyan) again experienced flooding caused by a low pressure area (LPA) until early this week. The LPA caused heavy rains over Eastern Visayas for the past weeks. This triggered flash floods and landslides in the recovering areas. This bad weather condition slowed down the relief and rehabilitation efforts in the affected areas even more. A long queue (up to 50km as reported) of trucks loaded with relief goods, including ours, were stranded in Matnog, Sorsogon, waiting for the weather to get better, and for their turn to be ferried to Allen, Samar. As of January 20, 2014, despite bad weather conditions that hamper the delivery of goods, the NCCP-ACT Alliance have repacked and distributed food support to cover the basic and supplementary food needs from a minimum of 4 days to a maximum of 20 days according to the sphere standards1. This was done through the the help of 2,266 volunteers representing 130 church denominations/ organizations. For target households, food will be provided until the end of January 2014. Aside from food items, NCCP-ACT Alliance distributed Non Food Items (Kitchen Utensils2 and Beddings3) and Hygiene Kits4. These kits are good for one month consumption to target households according to the sphere standards. NCCP also received in-kind donations from Churches and local partner organizations. 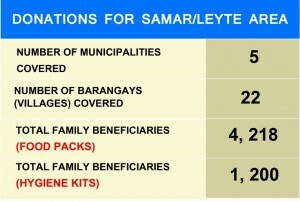 The food packs and hygiene kits were also distribu-ted in the NCCP target areas in Samar and Leyte area. Also, the Episcopal Church in the Philippines, in coordination with NCCP-ACT Alliance, also donated and installed solar panels to 10 barangays in 4 municipalities (Tacloban, Basey, Marabut and Hernani) in Samar and Leyte area. For the rehabilitation phase, community preparation is ongoing in Brgy. 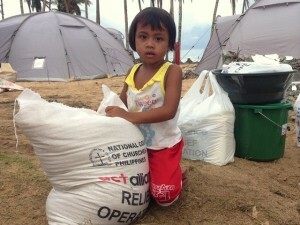 Salvacion in Jinamoc Island in Basey, Samar for transitional shelter. In Iloilo/ Panay area, there was an initial consultation made by our partners on January 2 with an existing women’s livelihood association in Estancia Iloilo. The possible livelihood activities planned include buy-and-sell of fish, crab growing, and processing of dried fish. For the mangrove rehabilitation, the NCCP team met with key people in Iloilo in preparation for the conduct of a training, in consultation with SEAFDEC (Southeast Asia Fisheries Development Center), for the community-beneficiary on mangrove rehabilitation. Our field officers have regularly attended the meetings of the Food Security and Agriculture and Shelter clusters of the UN OCHA (Office for the Coordination of Humanitarian Affairs) for coordination of emergency responses. The NCCP-ACT Alliance could not have done all this without the help of numerous donors from around the world. Our gratitude to all who have given their support to the project and we fervently wish that our efforts have contributed to bringing a glimmer of hope to the survivors and the necessary impetus to rebuild their lives. 2Kitchen Utensils include: 23″ plastic basin, 2 cooking pots, 2 serving spoons, 5 eating plates, 5 soup bowls, 5 tumblers, 5 pairs of spoon and fork.